The Horn reflector antenna, shown here in June of 1962, pioneered work in communication satellites. 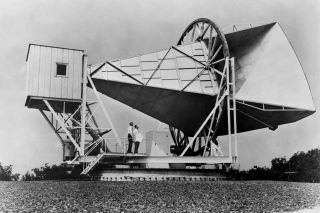 In this historical photo from the U.S. space agency, the Horn reflector antenna, shown here in June of 1962, at Bell Telephone Laboratories in Holmdel, New Jersey was built in 1959 for pioneering work in communication satellites for the NASA ECHO I. The antenna was 50 feet in length and the entire structure weighed about 18 tons. It was comprised of aluminum with a steel base. It was used to detect radio waves that bounced off Project ECHO balloon satellites. The horn was later modified to work with the Telstar Communication Satellite frequencies as a receiver for broadcast signals from the satellite. In 1990 the horn was dedicated to the National Park Service as a National Historic Landmark.